This picture is from when we had to drive off the road to go around a 12" deep mud bog. 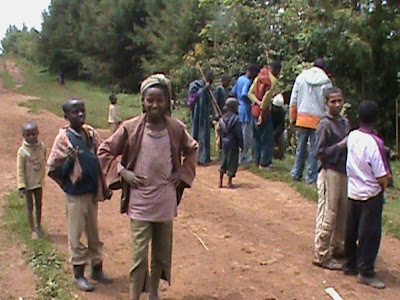 Abera, my farm manager is in the white coat, and the villagers are deciding how to get our van back on the main road. To fix the roads going to & from the farm, Lonny paid 4 men $5.00 total to work all day on the road. This is a good wage for them. He noted that if he'd had a skid loader, he could have done the same work in about 15 minutes. But it's probably a good thing he didn't have the equipment that would have made the job so much easier, because a big part of this mission is to bring opportunities to the people of Ethiopia, so whenever he can choose local labor over convenience, it is preferable. Four men went home with some money for their families today because of this job. Most of the people Lonny has met don't have much more than the clothes on their backs. They live day to day. Any work is welcome.